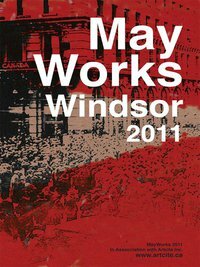 Windsor’s labour and arts communities join forces to present the second annual abour-focused cultural MayWorks festival. The various activities that are planned will highlight the support for our city and our history of solidarity, concern for social justice and our tradition of labour arts. The Mayworks 2011 Quilt Project was conceived as a collaborative effort to reflect the spirit of cooperation essential to the worker and collectively to the workforce. Our quilt celebrates workers, the work force and hard work, all symbolic of this year, 2011. The quilt block consists of two inch strips sewn around a picture depicting the worker’s struggle past and present. The contrast of the strips creates the appearance of the number 11 in each direction. The 3 strips closest to the picture represent the blood, sweat and tears shed by workers of the labour movement. All skill levels can handle this block. The finished size of the block is approx. 12”x12”. For more information visit Artcite or 10,000 Villages. The quilt will hang in a place of honour for the duration of MayWorks and will be displayed yearly in the Mayday Parade. There are many events planned for MayWorks, and we will preview them in the weeks ahead!